I really enjoyed my meal, which was fresh and light, yet filling and satisfying! The salmon was perfect, and the chipotle sauce was delicious! I really enjoyed the side of chips, which I normally would neither buy nor eat, but having some on the side allowed me to enjoy a few without feeling guilty. Same goes for the delightful pasta salad that was also included. I would definitely come to this truck again! Excellent wrap. Delicious chipotle sauce. Everything well constructed. The special...jerk wings, rice etc...GREAT FOOD! You fronted me the cash for a meal Thank YOU..but I have been waiting for you to return to Crystal City Plaza 2201 Clark St. above the parking garage. Caught Doug before the DC United game. So much better then the $100 hot dogs inside!! Bad side...my wife ate half of it when I found her! 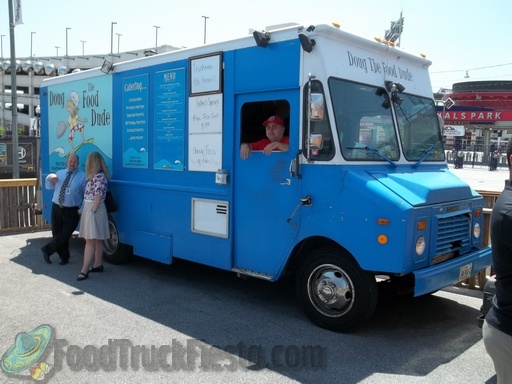 Aug 22, 2012 by Ken D.
Doug the Food Dude is a food truck serving the Northern Virginia Metro area. Doug serves Fresh All Natural (No MSG or Preservatives) meals. Doug started cooking fresh and all natural 5 years ago when his daughter developed allergies to MSG and preservatives. Some of his signature dishes are, Caribbean Roasted Pork drizzled with a mango garlic sauce over The Dude’s Cabana Rice, Crispy Baked Fajita Egg Rolls, and Parmesan crusted Salmon over Cabana Rice. The Dude now carries All Natural, Gluten Free, Hershey’s Ice Cream. The Dude caters for any occasion.